I’ve mentioned in prior posts that I’m a member of a great tasting group full of fellow wine geeks with whom I blind taste wines. Most of us are studying for the next level of a certification, while others are well-educated wine lovers looking to expand their palates. This past week one of our flights was so remarkable that it deserves mention in my blog! This particular flight was two white wines; one golden in color and the other so clear it could have almost passed as water by sight alone. 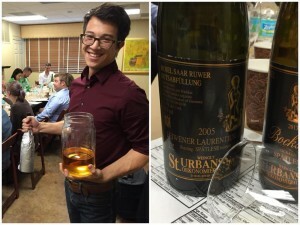 The golden colored wine had aromas of honey, over-ripe tangerine, baked pineapple and petrol. (Hmmm. 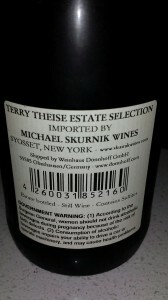 Could this be Riesling?) On the palate were honey and pineapple upside down cake! The very pale colored wine had a nose of grapefruit, apricot, lemon rind, slate and petrol. (Hmmmmm. Riesling again???) The palate was pleasantly sweet with great acidity to balance the residual sugar, and tasted of the lemon and some tangerine. The reveal of the wines was great fun! The golden colored was, not surprisingly, much older than the pale colored wine. 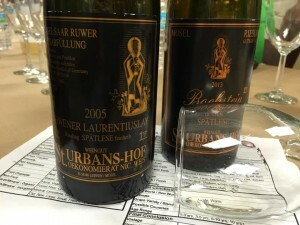 It was a 2005 St. Urbans-Hof Leiwener Laurentiuslay Riesling Spätlese Feinherb from the German region of Mosel. 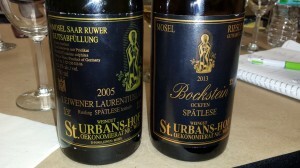 The almost clear colored wine was a 2013 St. Urbans-Hof Bockstein Ockfen Riesling Spätlese, also from Mosel. The wines are obviously from the same producer using the same varietal, but are from different vineyards and from vintages years apart. Also, the word Feinherb is used to indicate a wine that tastes dry or nearly dry but isn’t legally Trocken, which indicates dry. Therefore, on the palate the ’13 was much sweeter than the ‘ 05. The region of Mosel-Saar-Ruwer is considered by many to be the greatest wine region of Germany. Weingut St. Urbans-Hof is a family estate, which owns parcels in some of the finest Grand Crus of the Mosel and Saar Valley. They are known for making wines that bring out the authentic character of their site and their region. Tasting groups are such a fun way to have the opportunity to taste many different wines, and to taste some side by side. If you have a group of wine loving friends, get a group together. All you need is some fun wines disguised in a paper bag, some wine glasses, some water for hydration, and a group of cool, like minded people who enjoy wine as much as you do! Riesling, A Full Circle Wine! Things often seem to come around full circle. It happens in many aspects of our lives, including wine! Riesling is one of those wines. It is often the varietal people start drinking when they’re first getting into wine, and eventually ends up being a favorite, especially with experienced wine drinkers. A glass of Riesling is easy to drink and keeps us wanting more. “Keep filling up the glass,” we say! The often sweet or off-dry wines are attractive and easy to drink! The more we drink and learn about wine, many of us often decide that if it’s not bone dry, big, red, and full of tannin it’s not good. And yet many wine professionals believe Riesling to be the world’s greatest varietal! Hmmmm. How does this work? The high acidity of the Riesling grape keeps it all together. It balances out any residual sugar to make these wines very drinkable and fabulous accompaniments to a wide range of foods. AND, not all Riesling has an abundance of sweetness. 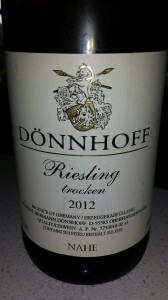 Last night I opened a bottle of the 2012 Dönnhoff Riesling Trocken from the Nahe region of Germany. This pale yellow wine has a lovely, aromatic nose with lime zest, lemon peel and white flowers. Some of the slate and petrol that is so typical in Riesling is there as well. “Trocken” means dry. This wine isn’t sweet, but it has wonderful fruitiness that livens the palate with a crisp, prickly effervescence on the palate. Peach, apricot, pear and great acidity round out the palate. And the price is great too!!! At about $20 a bottle this is one of my “go to” Rieslings for fun gatherings, sipping on my deck after a long day of work, and will be a great addition to my Thanksgiving dinner this year.